Gr. Prokne Mythological King Tereus, Philomela, and Prokne were turned into birds, a hoopoe, a nightingale, and a swallow. 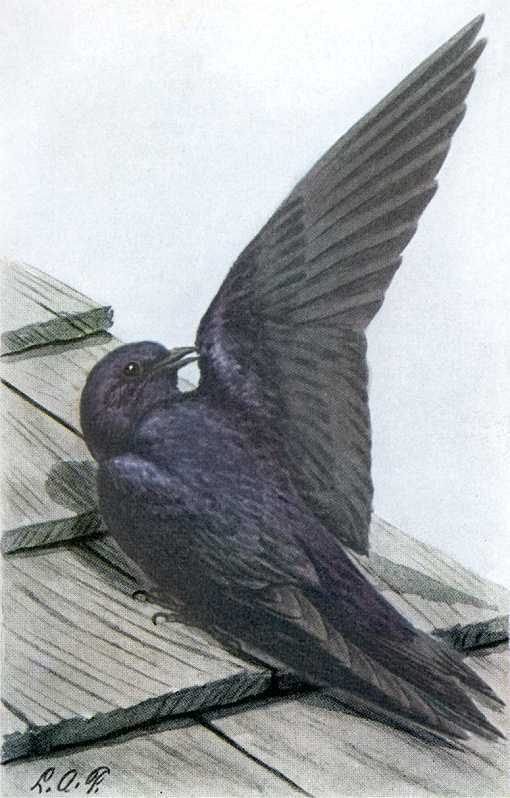 Largest swallow, about eight inches long with a twelve inch wingspan. Dark steel-blue except for brownish black wings. Female is brownish above and grayish underneath. Long thin speedy wings, moderately forked tail. 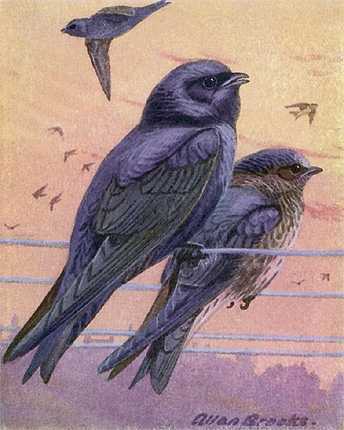 Purple Martins inhabit most of temperate North America from Mexico throughout the eastern U.S., north to Newfoundland, Ontario, Saskatchewan and Manitoba, in parts of the southwest and along the Pacific coast. Winters in northern South America. They build nests of twigs, leaves, grasses, feathers, odd rubbish and sometimes mud. They used to nest in natural or abandoned tree hollows and rock crevices. Now most purple martins nest in the popular martin houses or other nest boxes and gourds. There are rare reports of pairs or colonies nesting in their historical homes. A few have nested in cliff nooks, tree hollows and woodpecker holes, usually in the west. 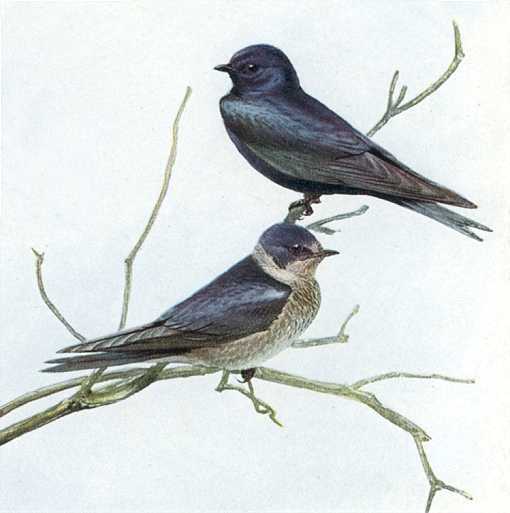 Purple martins feed on available flying insects depending on the area and seasonal fly hatches, moths, dragonflies, butterflies, horse flies, and deer flies. They scatter out over the country catching flying insects in graceful almost falcon like flight, low in cooler, cloudy weather and higher on warm sunny days, each parent returning to feed their young about one hundred times between sunup and sundown. Social birds, they greet each other gurgling and chattering, even visit each other’s nests. Females lay three to five white eggs, which hatch after about two weeks incubation and young leave the nest in about another three weeks. Martins like groups of single houses and houses with as many as 30 rooms although they seem to prefer somewhere in between the two extremes. Two or three apartment buildings do nicely for large colonies. 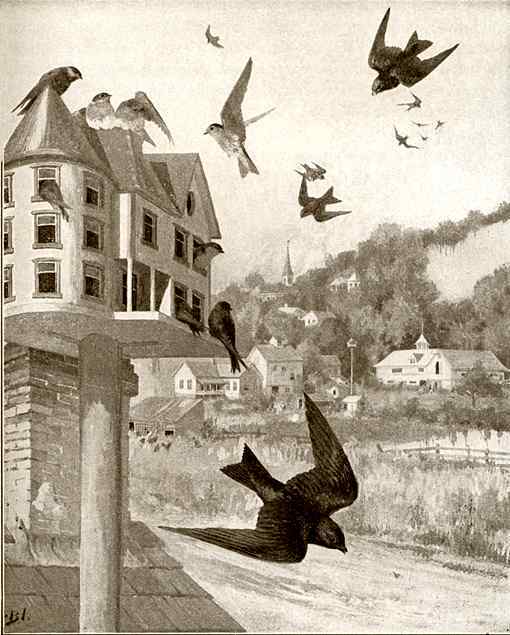 Their popularity and reliance on martin houses has created one of the great North American Pastimes: attracting colonies of dozens of martins to apartment like birdhouses mounted high in wide open backyards. Enticing colonies to occupy martin houses is so competitive enthusiasts utilize the latest research and tips – white paint to keep houses cool in the hot sun, room sizes and entrance hole sizes. Specially designed holes are shaped to deter intruders, railings protect the new born from falling, guards against crawling and flying predators reaching into the interior and more. Martins need to be monitored for competitors. Mobs of English Sparrows sometimes drive the weaker colonies from their homes which is why Martin houses should contain several homes or multiple nest boxes should be mounted. Colonies often just disappear because they are driven away by pests or because they are attracted to a nicer Martin house. Rooms should be at least seven inches cubed and deeper if raptors are a threat. Where owls are numerous door guards and extra deep rooms help prevent them from reaching into rooms. If a room is nine or ten inches deep, Martins will place the nest in the back furthest from the door. Paint houses white. Martins need a lot of care. It’s a job. Telescoping poles, door stops, starling resistant entrances and removable nest trays make the chores much easier. Easier means less likely to cause damage, quicker, safer, and reduced burden means the landlord is more likely to continue good responsible practice. Metal poles and pole guards help prevent predators from climbing poles. Some people provide sticks, straw, mud and other materials for their martins. Some even improve nests built by young inexperienced parents making sure floors are covered. If mites infest nests they will feed on the chicks blood – clean and replace the nests and you might be saving their lives. If an egg is broken, remove it to avoid unsanitary conditions. About the middle of August, martins begin migrating in large flocks towards South America. After they migrate north, martins arrive in southern U.S. as early as February and in Canada as late as May. See the map of general return arrival dates superimposed over the USGS Breeding Bird Survey map. Opening up rooms too early in spring invites sparrow and starling mobs. Some martin houses come with door stops. Or they are easily made. 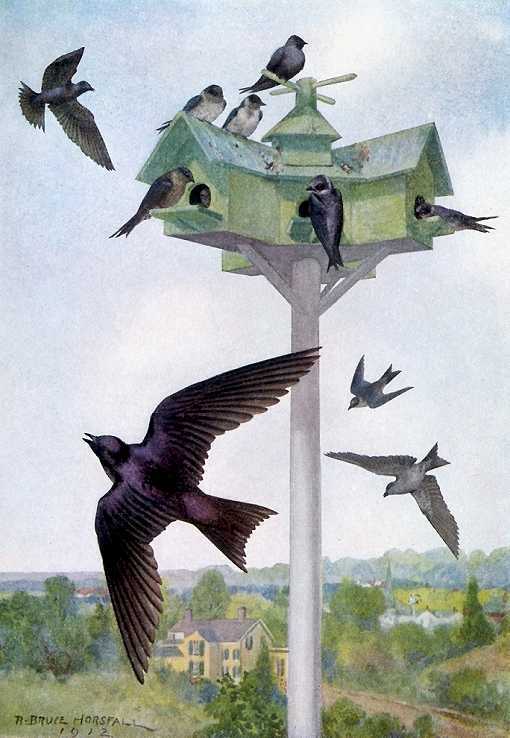 Landlords of existing purple martin colonies learn when it’s best to open the nesting boxes. Most martins and their broods return to the colony they occupied, were raised in, or to another near by. Males returning to formerly occupied homes immediately renew their claim. The female selects the room and both female and male build the nest two or three weeks later. Occasionally males fight over already claimed rooms. Although the first claim usually provides enough steadfastness to overcome intruders. Those attempting to attract new colonies should watch for martins and open rooms after the first martin sighting. Watch closely for English sparrows. Deal with the unwanted hoards immediately. Don’t be discouraged if sparrow or starling nests need to be removed repeatedly. You will discourage them and you will win. After they migrate north, martins arrive in southern U.S. as early as February and in Canada as late as May. See the map of general arrival dates superimposed over the USGS Breeding Bird Survey map.